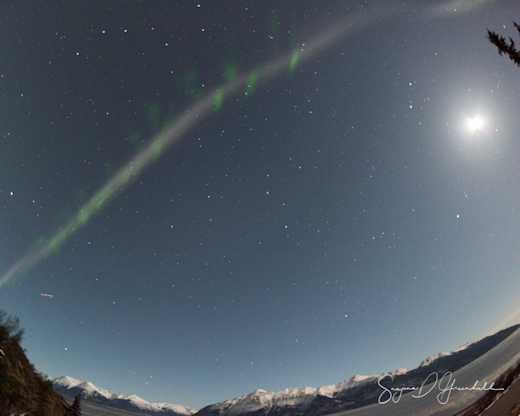 Strange Aurora-like Arc Sighted over Alaska: It’s “Steve”! 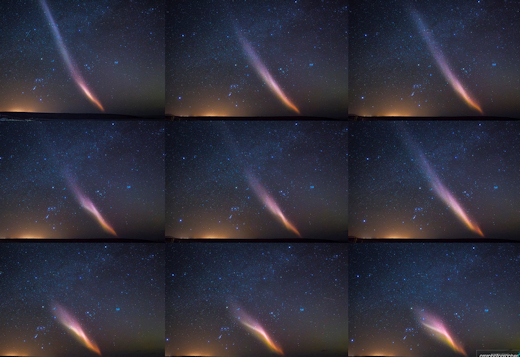 STEVE is an aurora-like phenomenon that researchers are only beginning to understand. For many years, northern sky watchers reported the form occasionally dancing alongside auroras. It was widely called a “proton arc” until researchers pointed out that protons had nothing to do with it. So members of the Alberta Aurora Chasers group gave it a new name: “Steve” (since upgraded to STEVE, an acronym for ‘Strong Thermal Emission Velocity Enhancement’). The first clues to the nature of STEVE came in 2016 when one of the European Space Agency’s Swarm satellites encountered the phenomenon. “As the satellite flew straight though ‘Steve,’ the temperature jumped by 3000°C and the data revealed a 25 km-wide ribbon of gas flowing westwards at about 6 km/s (13,000 mph),” reports Eric Donovan from the University of Calgary. Donovan and a team of colleagues led by Elizabeth MacDonald of NASA’s Goddard Space Flight Center have just published a paper on STEVE. In it, they confirm that STEVE is distinct from ordinary auroras, usually forming to the south of active Northern Lights. The mauve and purple colored arcs, they say, are related to supersonic rivers of gas called “subauroral ion drifts” (SAIDs), which flow through Earth’s magnetic field. Earth-orbiting satelites have tracked thousands of SAIDs: they tend to appear near latitude +60 degrees, and occur more frequently during spring and fall than summer and winter. The mystery of STEVE is far from solved. Researchers still don’t understand why STEVE is purple–or for that matter why the underlying rivers of gas should glow at all. “Further spectral analysis and modeling are needed,” say MacDonald et al. In other words, keep an eye out for STEVE.